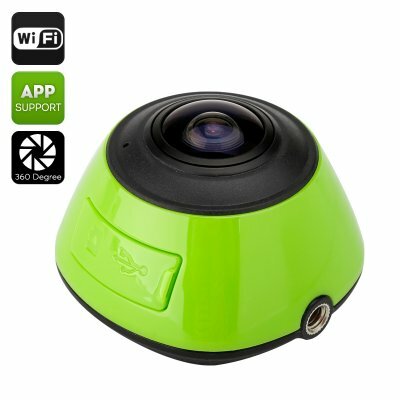 Successfully Added 360 Degree HD Action Camera - 360 Degree, 1/4 Inch CMOS Sensor, 1280x1024, Mobile Support, SD Recording to your Shopping Cart. See the world in 360 with this action camera capable of truly panoramic recording. Featuring a 1/4 inch CMOS sensor, 1280x1024 resolution, Wi-Fi support and more. Like most cameras made for an active lifestyle, this action cam is small, sturdy and perfect for outdoor adventures. What makes it stand out from the rest is its unique ability to take 360 degree footage. Yes, with this mini camera, your panoramic shots will be truly panoramic. This makes it a great choice for travel, sports, camping, hiking and other adventures. It also comes with 3 straps for head and body for easy mounting and great angles. With a 1/4 inch CMOS sensor and 1280x1024 resolution, the camera will offer great quality footage and crisp shots. You will be able to record your footage straight to the SD card (the camera supports up to 32GB) and H.264 compression will ensure your images and videos won't take up too much storage space. With Wi-Fi support, you can also instantly share what you’ve recorded on social media, send to family and friends and more. With Android and iOS support, the camera is compatible with your smartphone and sports a 2600mAh built-in battery for up to 3 hours of non-stop shooting. Offering way more than a standard action camera, yet sporting the same miniature size and durability, the 360 degree sports cam takes your action recording to the next level. The 360 Degree Wi-Fi Action Camera comes with a 12 months warranty, brought to you by the leader in electronic devices as well as wholesale action cameras..